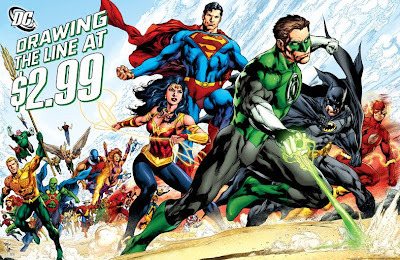 So DC Comics has just rolled out their "Drawing the Line" campaign and lowered all their $3.99 priced normal 32 Page comics down to $2.99. Marvel, who spearheaded the $3.99 pricing and bore the brunt of it's criticism, has also made a similar announcement following the one made by DC. Apparently they have only promised to not have any NEW comics come out with the $3.99 price tag. So of the two DC is the only company to promise a price drop all across the board. With no real reason for the price hike (and no it wasn't "inflation") one wonders why it was even there to begin with. "As Co-Publishers, we listened to our fans and to our partners in the retail community who told us that a $3.99 price point for 32 pages was too expensive. Fans were becoming increasingly reluctant to sample new titles and long term fans were beginning to abandon titles and characters that they'd collected for years," said Dan DiDio, DC Comics Co-Publisher. "We needed a progressive pricing strategy that supports our existing business model and, more importantly, allows this creative industry to thrive for years to come. With the exceptions of oversized comic books, like annuals and specials, we are committed to a $2.99 price point."